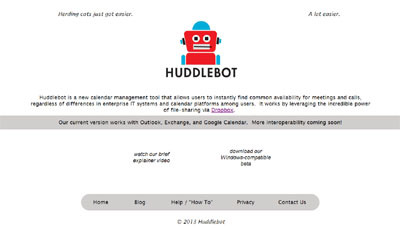 Huddlebot is a calendar management tool that allows users to instantly find common availability for meetings and calls, regardless of differences in enterprise IT systems and calendar platforms among users. It works by leveraging file-sharing via Dropbox. Huddlebot is not a polling engine a la Doodle, which involves waiting for responses and doesn’t always work, nor is it a website-driven publication-of-one’s-availability solution. Instead, Huddlebot allows users to instantly triangulate common availability while preserving privacy and control for everyone. In a sense, it’s a way to “socialize” Outlook and Google Calendar without giving up privacy or control to others.